I’ve been reading everyone’s Top 5 Wednesday posts for awhile now since they are pretty much the only posts in my reader on Wednesday; they are all very interesting! I thought some of the topics sounded intriguing and since I have wanted to do this particular topic for awhile on my own, I thought this would be a good time to start. I have also been wondering what books would be the best to start with for other genres so I look forward to all of your posts! This Weeks topic is: Books to introduce others into your favorite genre, which for me is Fantasy! I picked the following books because they have such engaging plots and awesome characters that I believe they will hook someone into reading more fantasy. They also are not overly complex, but still loved even by intrepid fantasy readers. Note: I did not include Harry Potter on this list because…well…duh. JUST READ IT ALREADY! 🙂 They are also not in any particular order. Yes, two of these are children’s series, but OMG they are AMAZING! Check out my review of Cinder! Check out my review of Steelheart! Awesome series set in a Queendom! Slight romance, but well done even though there is a love triangle! Check out my review of The Demon King! 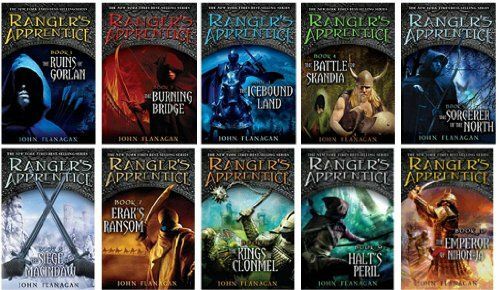 Fablehaven, Ranger’s Apprentice and all of Sanderson series are in my TBR. I can’t wait to read them! Great top 5 this week. Yesss Seven Realms series is actually my new favorite series ever!